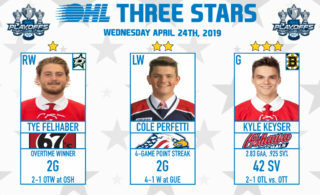 The Guelph Storm are the fifth team in OHL history to come all the way back from a 3-0 series deficit, doing so with five unanswered goals on Tuesday night in London to defeat the Knights by a score of 6-3. The Knights led 3-1 early in the second period before CHL Player of the Week Nick Suzuki (10) cut the lead to one at 6:59. 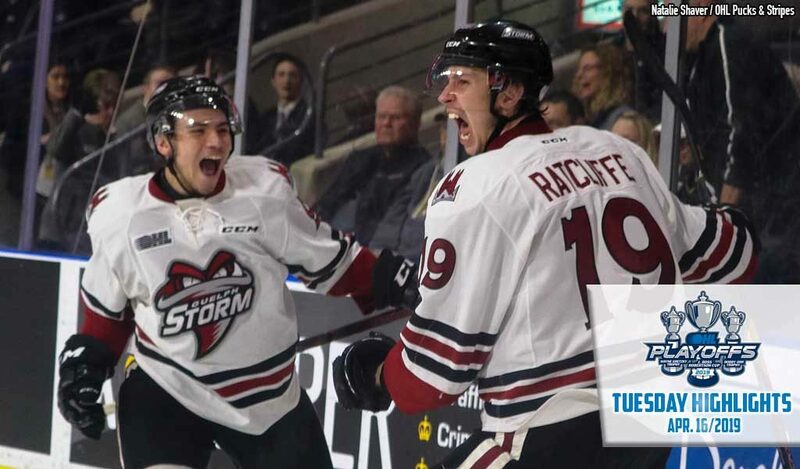 The Storm took complete control early in the third as Londoner Isaac Ratcliffe (4, 5) struck with a pair of goals just over a minute apart to put Guelph in the lead before MacKenzie Entwistle (5, 6) tacked on a pair for the 6-3 final. Alex Formenton (4), Connor McMichael (2) and Liam Foudy (6) scored a flurry of second period goals under three minutes apart but that’s all the offence London would pull together, seeing a 3-0 series lead evaporate for the first time in franchise history. The Knights outshot the Storm 34-28 as Anthony Popovich made 31 saves for the win. Suzuki ended the night with a goal and two assists, going 19-for-30 in the faceoff circle while Ratcliffe had two goals and a helper. Blueliner Sean Durzi collected three assists for the Storm. 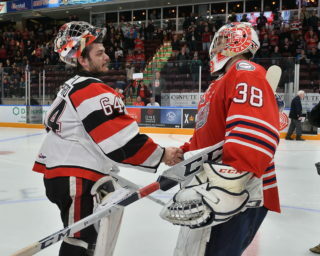 It marks the second time the Storm have eliminated the Knights in Game 7 following another 6-3 road win back in 2004. 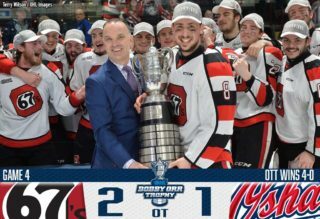 The Midwest Division champion Knights were led in playoff scoring by captain Evan Bouchard (4-17–21) on the blue line, who closed out Tuesday as the OHL Playoff scoring leader. The series finale was played before a crowd of 9,009 at Budweiser Gardens. 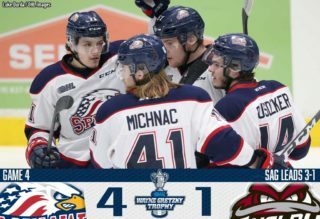 The Storm join the 2014 Peterborough Petes, 2005 & 2010 Windsor Spitfires and 1988 Ottawa 67’s in coming all the way back from a 3-0 series deficit to advance to take on the Saginaw Spirit in the Western Conference Championship Series that begins Thursday night in mid-Michigan.